And in Bulgaria…they are a lot! Banitsa even helps us to see our fortune for the next year on New Year’s Eve, and a lot more. Today we will present you a few types that you can buy on the street, at some bakery or try while visiting someone. It is prepared easy and fast, tastes amazing and smells delicious. This type of banitsa is made from pastry sheets and stuffing of eggs, white cheese, yogurt, butter or sunflower oil. Once you’ve tried it, you will fall in love with the taste. The original layering of the Bulgarian homemade banitsa is two piece of pastry sheets at the bottom, followed by filling (eggs, white cheese, yogurt, and butter), then only one sheet over it, again filling, and at the top two more piece pastry sheets. Before put for baking, the banitsa is poured with a mixture of eggs and yogurt or fresh milk, and then it is baked until ready. In some variations, the recipe is like the classic green banitsa – with white cheese and eggs, combined with boiled or fried cabbage (prepared in the same way as the green banitsa with lettuce). In other cases, it is without the eggs and cheese and is prepared as luchnik (luchnik – banitsa with onion) with cabbage and onion. There is also a variation where the filling is not only with onion and cabbage but also with leek and white cheese or even without the onion. The most interesting cases are when the zelnik is adopted as a name for “green banitsa”, and it is accepted that every banitsa with rumex, sorrel, atriplex or utrica is zelnik but except this one with the cabbage. The banitsa with cabbage or lettuce is not so widespread and it is even unknown in many places in Bulgaria. It is filled with leek with/or onion. Tomatoes and red peppers are also added and are spiced with savory and parsley. It is baked or fried in sunflower oil until ready. Patatnik is a typical dish for the Rhodope Mountains region. 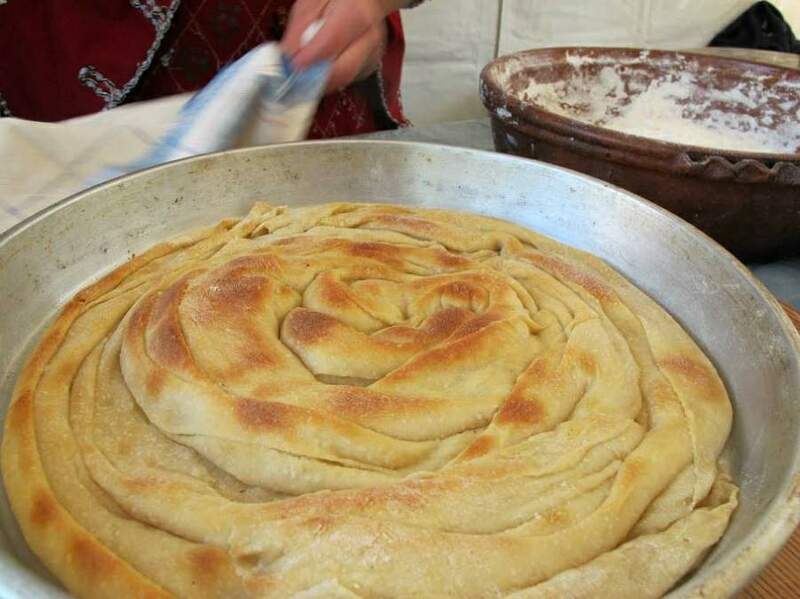 The people from the region don’t recognize it as a type of banitsa but in almost all parts of Bulgaria is equated as such. There are also modified recipes of the ordinary vegetable banitsa with potatoes, which are called in the same way, although from the viewpoint of the Rhodope people it is incorrect. Tikvenik is a specific type of sweet banitsa with a filling of grated pumpkin and sugar. It is prepared in the same way as the rolled banitsa. The pastry sheets are rolled like a roll with an even placement of the filling from pumpkin, sugar, crushed walnuts and sunflower oil. The ready rolls are placed in a tray usually rolled up in a circle and baked. It is served with milk, yogurt or compote. Also popular is the receipt for tikvenik, made like the traditionally layered banitsa. When it is made in this way, it is usually layered like the banitsa from apples or with stuffing similar to *baklava with nuts – walnuts or peanuts, hazelnuts, pistachios, and others. *Baklava – a dessert originating in the Middle East made of filo pastry filled with chopped nuts and soaked in honey.